I just love Alison Glass fabric and when I saw the signups for the Alison Glass Mini Swap on Instagram (#alisonglassminiquiltswap) it was a total no-brainer to sign up. It was also a good excuse to add more of her fabric to my stash. I already had a few pieces of yardage from her 2015 Sun Print line, but I bought a fat eighth set of the Sun Print 2015 Mercury. I first used them in this zipper pouch. As I've mentioned before, I like swaps for pushing me to try something new. This was the first time I've done dense straight light quilting. I used my walking foot, and my lines are slightly farther than 1/4" apart. I started from the middle and worked my way out. There was one section I didn't do this way (trying to keep the lines equally spaced) and I ended up with a little pucker in my fabric. :-/ Lesson learned. Have you done quilting like this (or even more dense straight lines)? Any tips? I also made a little zipper pouch to send along with the mini. I realized after the fact that I ended up with a bit of a + and x theme in this bundle. 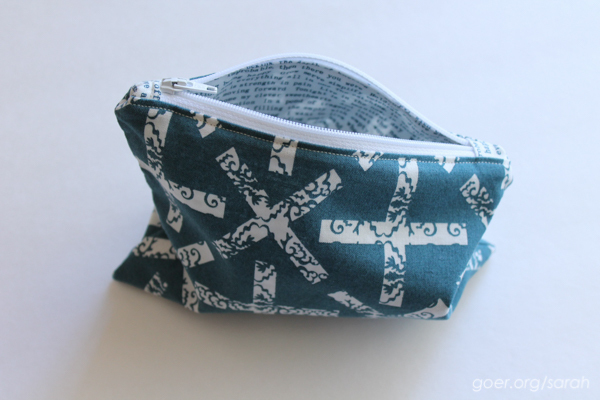 The pouch uses this tutorial from Make It Perfect. 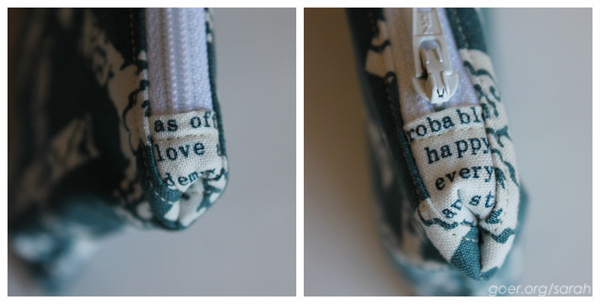 I fussy cut the text fabric to feature “love” and “happy” on the edges of the zipper top. Here's the full pile of goodies that I sent to Claudia in North Carolina. The funny thing is, before I finished and mailed the package to Claudia, I received my swap package in the mail... and it was from Claudia. What a surprise that we were making for each other. Here is the beautiful Preppy the Whale mini in Alison Glass Handcrafted that Claudia made for me! 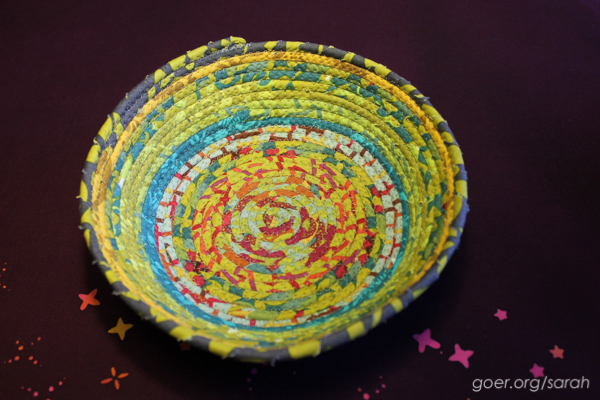 She also made the beautiful bowl that I drooled over when I saw her making it on IG. How delightful that it was for me! She spoiled me with a variety of other goodies as well! 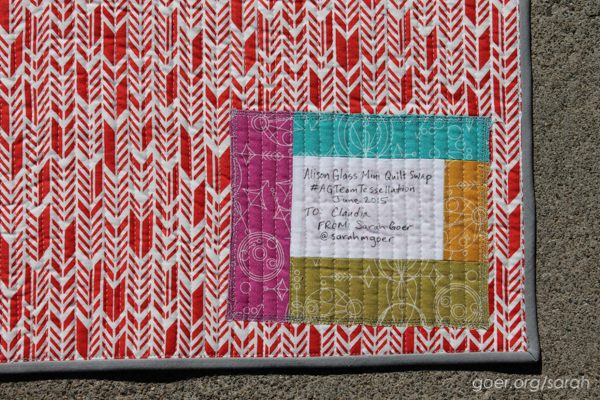 I'm linking up at the Stash Bee June Linkup Party, Needle and Thread Thursday, TGIFF, and Finish It Up Friday. 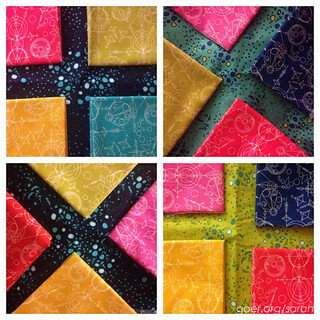 Patchwork City Mini Mini Quilt Schnitzel and Boo Mini Swap Sew My Stash Mini Quilt Swap IG Mini Swap for Me! Posted in Quilting. 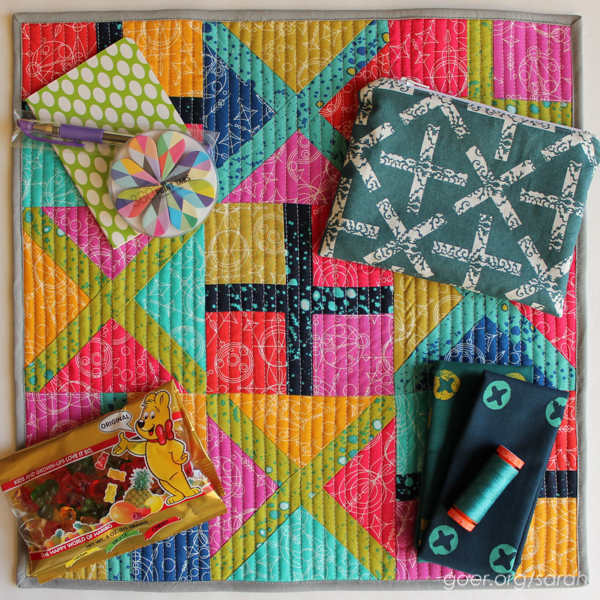 Tags: Alison Glass, Alison Glass mini swap, Alternative Quilt Pattern, zipper pouch on June 24, 2015 by sarah. I love this mini that you have created! It is so bright and fun. Now that I have seen your match stick quilting on it, I couldn't imagine it quilted any other way. I downloaded a Craftsy class on walking foot quilting and in it they suggested using painters tape or marking a few register lines to keep the lines spaced and straight. But honesty, your lines look great. Hi Tish. The other option I considered for quilting was graffiti quilting, but I wasn't sure how the recipient would feel about that. Painters tape is a great idea. I've used the walking foot on my last two minis (the most recent will be up on the blog later this week) and I've just kinda gone for it. On this one I used the edge of the foot up against the previous line to get "equal" spacing. I'm excited to do some more with the walking foot. Funny, since I basically stopped quilting quilts way back when until I learned how to free motion quilt. 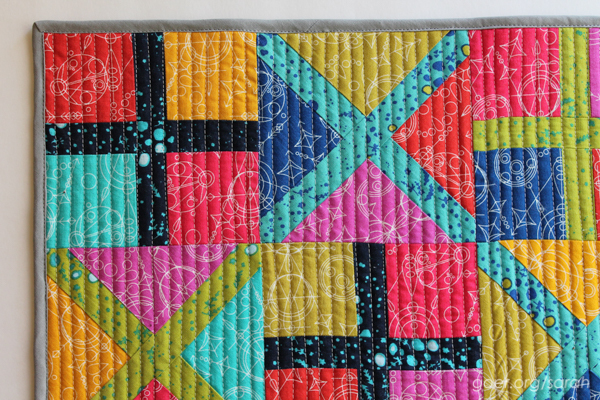 I also love the match stick quilting I've seen by others with a variety of thread colors. (I thought this project already had so much color that it probably wasn't the right time to try that!) Thanks for visiting! 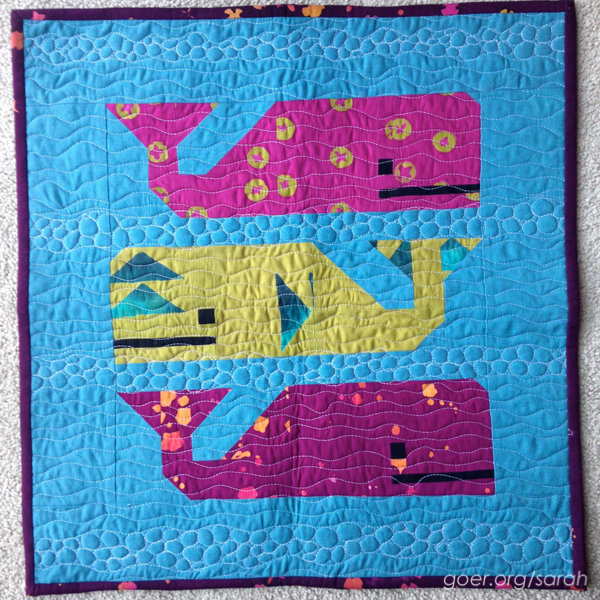 This mini is great, I love the colors and the quilting. This swap thing seems like fun!! Fun and addicting. Thanks for visiting, Bo. Sarah, this is fantastic. 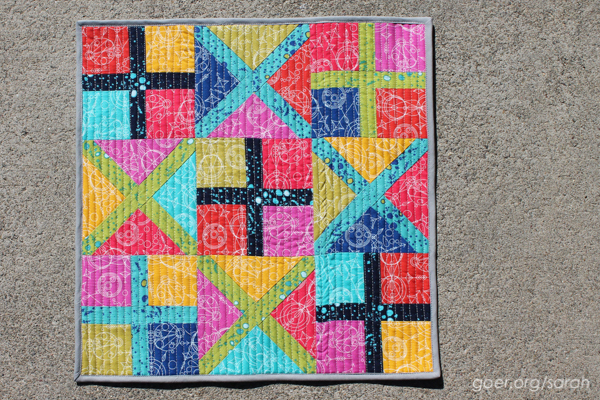 I am such a fan of simple straight line quilting and yours looks gorgeous. How fun to have the partner thing going both ways, I wonder if that was an accident? Pretty nice either way. I had been admiring straight line quilting around the blogs and IG and was excited to try it out. I'll definitely use it again. I might even go with denser lines. I worried that giving to each other was an accident. It might have been. But nobody has said anything to me. :-) Thanks for visiting! Alison Glass fabric is hard to find down here in Tasmania, Australia but I think I might need to order me some! 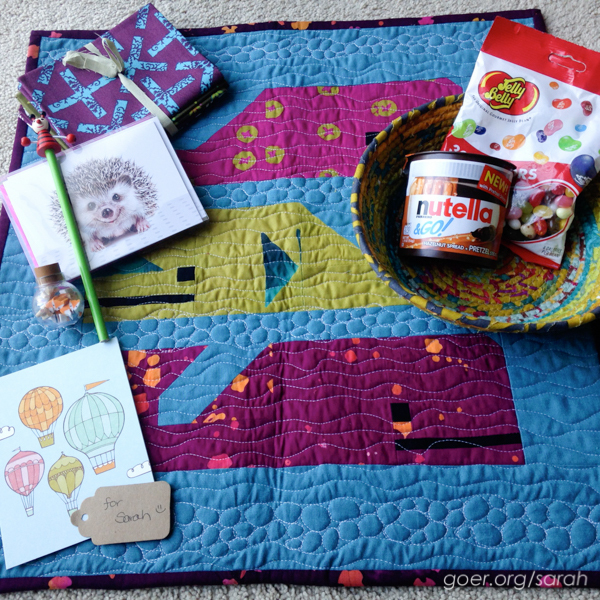 What gorgeous colours and a stunning mini quilt. Great job Sarah! The bowl you received is certainly drool worthy! I've never participated in a swap but maybe it's something to try in the future. Thank you so much, Deb. I'm afraid I'm going to be really sad when this particular line is out of print. I might need to stock up. Definitely order yourself a generous amount. It's beautiful and it plays nice with others as well. Can't wait to see what you make! Popping over from the Q2FAL. Your finishes are all so fun! I'm not a fan of mini quilts but you make me want to be. Thanks for being inspiring! such a lovely mini you made for your partner, it's so colourful and I love the design. Thank you, Wendy. It may be the swap mini I've made that I miss most. 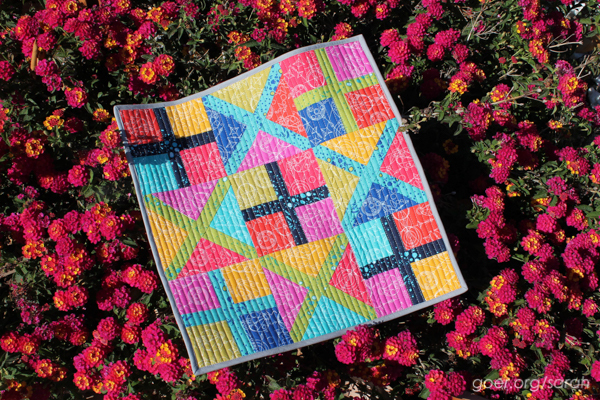 Alison Glass fabrics are so vibrant and happy. So easy to work with! It's all lovely Sarah - both what you made and what you received.